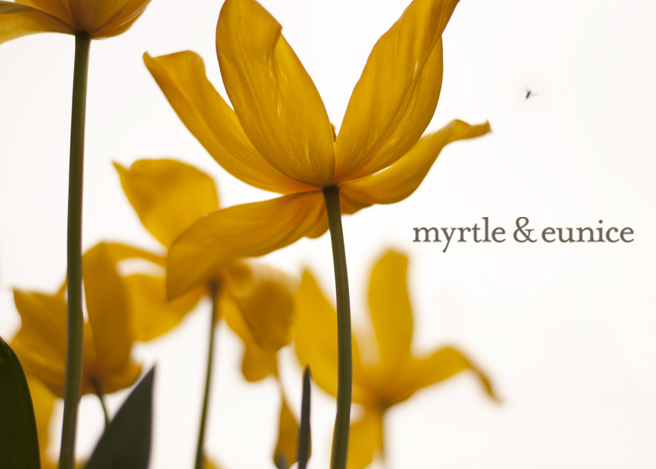 Myrtle & Eunice: Ruby has a good giggle, can do ‘flat’ splits and bounce on the trampoline as high as space!!! Ruby has a good giggle, can do ‘flat’ splits and bounce on the trampoline as high as space!!! My girl’s friend, Ruby, had her ninth birthday recently. 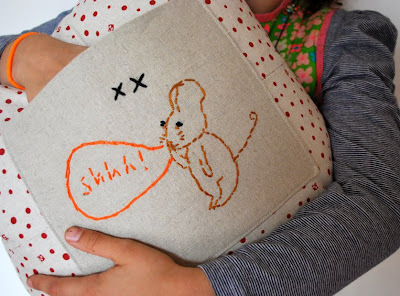 It was my kid’s idea for me to make her pal a cushion. It was my idea to put the kid to work too. I had some red, ruby-red, strips leftover from that sofa quilt throw thingy and put them together, along with some natural linen. My kid wrote directly on the linen strips with a water erasable pen, while her mother sat on her hands and restrained herself from art direction (note the three, THREE!!! exclamation marks). I then set to with the embroidering over the top bizzo, thinking I’d stretch myself and learn stem stitch. After the first word it became apparent that Ruby would be receiving her cushion for her 39th birthday. The rest is, therefore, er, backstitch. It’s a cushion full of (my) wonk (you should see how centred that back secret pocket isn’t – shhhh!) and involved early mornings and evening pocket stitching by my kid. 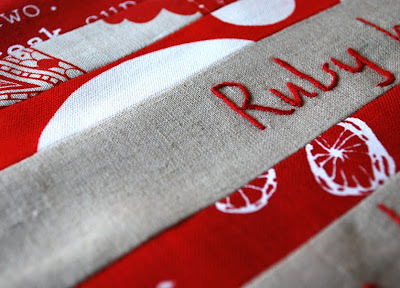 It’s a pressie also made with a whole heap of genuine heart (because we both reckon Ruby is the bees knees). PS. That isn’t Ruby, that’s my kid. Even though both of them think they are ‘exactly the same’ (including the bit about both having ‘slightly weird’ mothers). Exactly the same, even though Ruby has long and incredibly straight blonde hair and looks very much different but still exactly the same. If you know what they mean. That cushion rocks T. I absolutely love it. My goodness, you are such a talented soul. That cushion is fantastic - and your girl is so pretty, my goodness! what an awesome gift for miss ruby. one i am sure she will treasure forever & ever! The cushion is adorable, a fantastic gift. Oh I so love this post ! The cushion is gorgeous and so is your girl . Yay for wierd mothers ! Big claps for the big kid, that's such a beautiful present, Ruby is a lucky girl (and quite bendy from the sounds of it!). That is just gorgeous - I love the way you combine all those reds with the linen. I don't know if I could actually part with it! That is the BEST cushion! How clever you are I love it, and what a gorgeous girl you have..I love that sweet friends are exactly the same & totally different, sounds like a very special friendship. I love my girls best friend Beth too. It's great. That is so cool- I love it and may steal the idea at some point when I am stuck for a gift for a 9 year old who has a great giggle!! i hear you about the stem stitch- I tried it the other day , it looks great but yes, takes f times as long as the ever faithful and lovely lookin' backstitch. Very fancy pants cush and very very gorgeous daughter. Best ever kid/mum for friend collaboration. Just so fabulous. Kids dont see the differences just the sameness, lol! 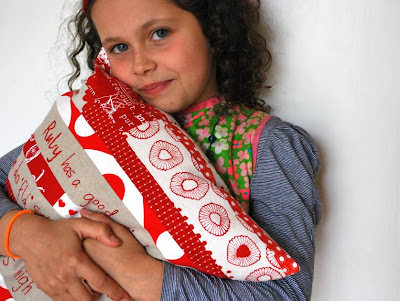 Your daughter is so cute too and a great model for your cushion. What a superb pressie! they make me cry and dissolve into a big puddle... currently in puddle mode. That is one gorgeous cushion. You are so clever. geez...you hand stitching is impeckable. I love the cushion, I love that you have made it together. And, like Kristi says, your hand stitching is impeccable! Bestest bestest present ever ever ever!!! oh very nice, what a thoughtful gift. Gotta love your beautiful "kid"
Awesome cushion. I wish I could do flat splits. Tarn, That is one fabulous cushion! Your kid is a pretty good cushion model also. I have a few birthdays coming up. 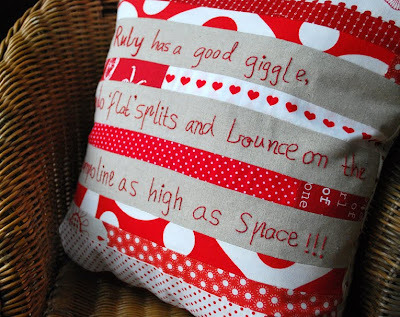 Ruby is the bees knees and you know that cushion is going straight to the pool room. That kid better be a hoarder and I hope when shes a nana she has that cushion on her rocker and whenever she sits on she gets all weepy and has to blow her nose on a great big cotton hanky. you are the best. You two have outdone yourselves. I just love the free-ness of the sentence, which fits perfectly with the style. The secret pocket, the colors ... It's all just right! That is just beautiful! Love it, the writing is fab. thats gorgeous i hope my hand stitch can look that good someday! I think that is probably the best present I have ever seen oir heward about. What person of any age wouldn't love a personalised pal cushion. You(s) are two very clever chookies. It's a stunner and I bet Ruby loves it!!! (sorry, I couldn't resist). p.s I missed the previous post but man, you made that yarn and those plastic-y heart thingys look even better than real life ... I really want to use an exclamation point there but I think I've used up my quota. Love the passing down if crafty skills and I love the use of the exclamation mark! It says so much on it's own - she obviously loves Ruby three times as much!!! WOW I'm loving Ruby's cushion - one lucky girl! uuugh, i love that last photo so much. her love for the pillow or for you or for ruby, or for a camera pointed at her, whatever it is, uuuuugh, i love her loving adoring look!!! and the pillow is damn sweet. shhhhhhh. my favorite part. What a very lucky "kid", making things with mummy. I I I remember trying to restrain myself from input and control with my children when we were crafting. The cushion is really beautiful. that is outrageously adorable, ruby is going to treasure that forever! The kid's a nut. Luckily I'm sure dear Ruby is too. Fabulous cushionwork, Mrs. Now you teach me to install a zipper?! What an absolutely adorable idea! It is so personalized...that's why I love it so much. I would really love to copy this idea to make for my little niece for her birthday. Amazing! What a lucky girl!You are so clever! ... and can you ever have too many exclaimation marks?? ?